My gaze wanders past Jessica Hellmann and out the window of Grace Hall’s Café de Grasta as she and I chat. A flash of orange, a robin that has just fluttered past, catches my eye. It’s a beautiful day in early March, a week before St. Patrick’s Day, a picture-perfect blue sky, temperatures in the low 60s, trees thick with buds on the Notre Dame campus. This is a day as all days should be. It is nothing like the typical March South Bend day I have grown to expect. You know the ones: all frigid rain, wind-swept bluster and heartache. Now that is South Bend in late winter. So has paradise come too soon this year? And if this is March, what is July going to be like, I wonder. Then my mind snaps back to the conversation at hand. “Huhhhhhhhhffffhhh,” comes a protracted sigh. “Well, yes and no,” says the Notre Dame associate professor of biological sciences, who is on sabbatical writing a book about what should, or could, be done to help species transition to a warmer world. First of all, Hellmann says she thinks it is unfortunate that climate change has become politicized. Regardless of political orientation, we all inhabit the same planet. Further, she thinks the actual debate among climate scientists is often misunderstood by the general public and misrepresented in the popular press. All scientists are trained to be skeptics, the biologist who analyzes butterfly migration to study climate, points out. However, skepticism — namely wanting more proof before reaching a conclusion — is not the same as saying no problem exists. Such a head-in-the-sand attitude is not scientific skepticism but denial, she contends. Climate scientists argue all the time, Hellmann points out, but it’s not about what the public thinks. “There are huge fights over what kinds of clouds will form in a warmer world and what effect they might have. There are huge fights over hurricanes, and the severity of weather patterns.” But, she adds, there are not many scientists who would say greenhouse gases do not increase the average global temperature. There is no question, Hellmann says, that carbon dioxide levels in the atmosphere have risen precipitously in the past 100 years, and that this surge continues at ever faster rates. To emphasize the point, she draws a graph of undulating squiggles on a slip of paper. “This, she says, “is atmospheric CO2 plotted through time. You can see the levels go up-down, up-down, up-down, depending on whether the Earth is in an ice age. So here we are now,” she gestures to a straight-up line shooting off the page. CO2 quite literally is blasting into the stratosphere, and there is no sign of re-entry. With that as a backdrop, the ecologist argues it is imperative to prepare for that future. 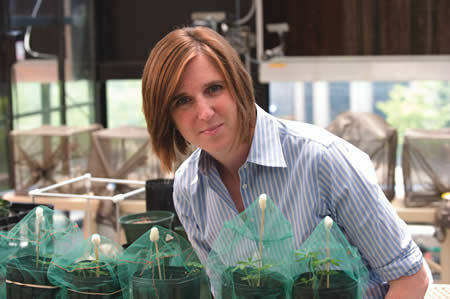 For her book, she’s examining a variety of proposals scientists have advanced to help species cope with a warmer world. Those strategies include managed relocation, in which species might be transported to new habitats. Another scheme is setting up ecological “corridors” that would make it easier for threatened species to move on their own to more favorable places. Then there’s the “Noah’s Ark” approach in which representative specimens might be put in zoos, or fertilized eggs are frozen, with the species eventually to be re-introduced to the wild. “A lot of what we’re talking about is manipulating nature. Some of the more drastic ideas involve putting species in new places. Implicit in all of this is that the human race has some culpability for where we’ve taken the planet. Namely, we’ve altered the fundamental underpinnings of what makes things live where and how well they do there. We are a major force of nature in our own right. John Monczunksi, who retired from this magazine in March, is a freelance writer. Originally published by John Monczunski at magazine.nd.edu on August 16, 2012.